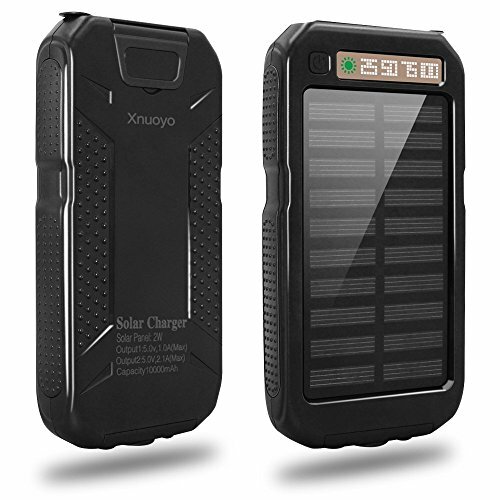 Why choosing Xnuoyo 10000mAh Waterproof Solar Charger? The solar charger is a photoelectric conversion device which can convert light into electricity, the principle is convert light energy into electrical energy by using the photoelectric conversion panels and stored in the built-in capacity of 10000mAh lithium polymer battery. The Solar Charge panel affected by the weather, location and others factors, it is not very big, so it will spend much times to be charged by the sunlight. The laboratory test it will take about 48 hours to be full charged, It's perfect for emergency use. In daily life, we highly recommend to charge this solar power bank via wall charger. Press the button twice, SOS Model flashlight light will be turn on, same press for turning off. Xnuoyo Solar Charger has Super Waterproof (IPX4) function. It will work well in daily life even in the rain day. But we do not recommend to throw it into the water. When the power bank can't be recharged, please click the power button or replug or change the cable to activate the unit. If you have any questions about this product by Xnuoyo, contact us by completing and submitting the form below. If you are looking for a specif part number, please include it with your message.